6012 Kirby Drive | FOR LEASE in West University Place, TX! 6012 Kirby Drive | LEASED in West University Place, TX! 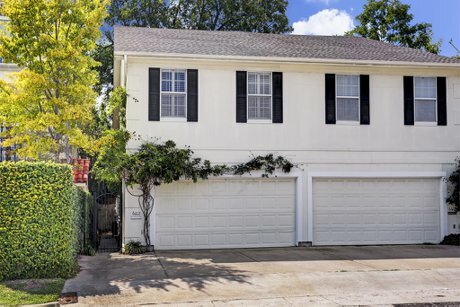 6012 Kirby Drive is a three story townhouse with four bedrooms and three full baths. First floor living, four bedrooms on the second floor, and a third floor game room. Lots of space! Terrific walkability to Rice Village. Move-in ready. Open concept first floor living. Recent paint throughout the house. Hardwoods on the first floor, on the stairs, and the second floor hallway. Granite kitchen with stainless steel appliances. Refrigerator remains. Gas cooktop, convection oven, Bosch dishwasher. Excellent storage space. Gas fireplace in living room with black granite surround. Built-in Bookcases. Sliding doors open into the backyard. Spacious master bedroom suite with two closets. Master bath has granite counters, double sinks, jet tub and separate shower. Three secondary bedrooms on the second floor. Second floor utility room, washer and dryer remain. Large third floor game room. Fully fenced backyard with a patio deck. Pets on a case-by-case basis. Zoned to West University Elementary, Pershing Middle School, and Lamar High School. Please check availability.